Let’s reintroduce each antenna. The 43 foot fixed height antenna is purposely chosen to never be a half wavelength at any desire band. Thus it must have an antenna matcher between it and the transceiver. The BigIR has adjustable height to provide a perfect 1/4 wave height above your ground system. For the shorter bands, 3/4 wave mode is also available as is the case for 15 meters. 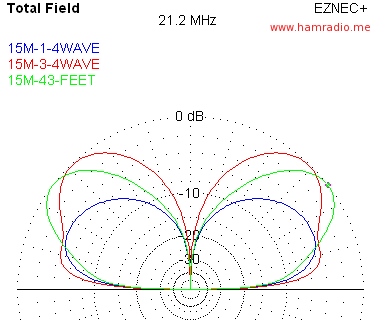 All three antennas, the 43 foot and the BigIR in 3/4 and 1/4 wave mode and their antenna currents are shown below. 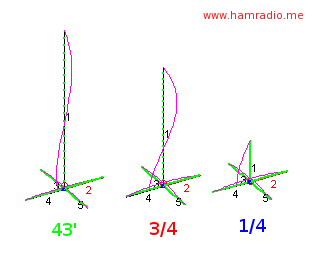 The current profiles for the 3/4 and 1/4 mode are just like any other antenna the same electrical length. The 43 foot antenna constrains the electrical length to around 7/8 wavelength. The SWR for the BigIR is nice and low for both the 1/4 and 3/4 mode. It was slightly better in the 3/4 mode. The 43 foot vertical definitely requires a tuner. Both DX Engineering and Zero Five suggest if you are going to use the tuner in your shack then place a 4:1 transformer at the antenna feed. This converts the 50 ohm coax impedance to 200 ohms. Indeed, when EZNEC is used to check SWR at 200 ohms, it is far lower, but still about 5:1. At 15 degrees or so elevation all three antennas show similar energy with the BigIR showing an edge in both the 1/4 and 3/4 wave modes. At higher elevations the 43 foot begins to show an advantage. It is hard to declare a winner with this data. We will need to analyze more bands. Stay tuned to the RSS feed.